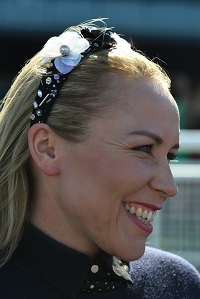 Warwick Farm trainer Clare Cunningham believes the 2300 metre trip is the only query with Keep Up, the short priced favourite in Wednesday’s $50,000 Hungerford Hill Cessnock Cup (2300m) at the Newcastle Racecourse. The former Kiwi galloper heads to Newcastle after an impressive last start win over 2100 metres at Hawkesbury on November 8. Keep Up is raced by Hong Kong business-woman Nancy Wong and the six-year-old is in his first preparation with Cunningham after racing in New Zealand. On September 19 the gelding finished second, a length and a half behind High Bridge in a Benchmark 74 over 2200 metres at Warwick Farm. “This horse is his own worst enemy. He wants to lay in and he is an emotional horse,'' Cummingham said. "The key to Keep Up is that the jockey has to get him to switch off during the race. He has the talent to develop into a handy stayer, but he is a work in process. "We tried blinkers on him but he over raced, so we took them off. Three Warwick Farm trained horses Keep Up, Dylan’s Romance and Hirokin dominate early markets for the Cessnock Cup. Dylan’s Romance was narrowly beaten in the recent Queanbeyan Cup while Hirokin finished alongside Dylan’s Romance at Queanbeyan after a placing in the Coonamble Cup. Scone trained three-year-old Nick The Skip will race with blinkers on for the first time when he attempts to break a run of seconds in the 1200 metres $40,000 Nichols Electrical Country Showcase Maiden Plate. Nick The Skip has been runner up in his past four starts and he has the rails barrier with Robert Thompson to pilot on Wednesday. He was runner up in the Inglis Challenge on Scone Cup Day in May and the gelding is well placed under the set weight conditions on Wednesday. Kris Less will saddle up early favourites, Designer Maid (race 1) Crowd Surfer (race 3) and Hermosa Reward (race 5) together with the well fancied More Chilli in race 4. Lees already with 72 winners this season is on target to be the first non-metropolitan trainer to train 200 winners in a season. Designer Maid was bred and is part owned by Lees mother Vicki and she is a fast filly suited to the short course. She bolted in by more than five lengths on debut at Taree in July and she resumes after a nice trial. Crowd Surfer was runner up on debut on a heavy track at Taree last month then was a close fourth at Muswellbrook. He has the best form in the race. More Chilli’s only two starts have resulted in a close second to smart stablemate Kedah at Muswellbrook and a Scone win. Both races were in July and he has had two recent trials. Hermosa Reward is in good form and Lees scratched her from the much stronger Provincial Series Heat on Sunday to run in this race. Kulnura, trained by David Atkins will oppose Hermosa Reward and he is a serious threat. Robert Thompson rides Kulnura for the first time and the on-pacer has the rails barrier.